Bringing Athletic, Fitness & Recreation ProS Together for 40 years. ​​Since 1977, Athletic Business has been at the center of the industry helping athletic, fitness and recreation professionals find the products, services and solutions they need, from companies like yours, in order to run successful programs and facilities. 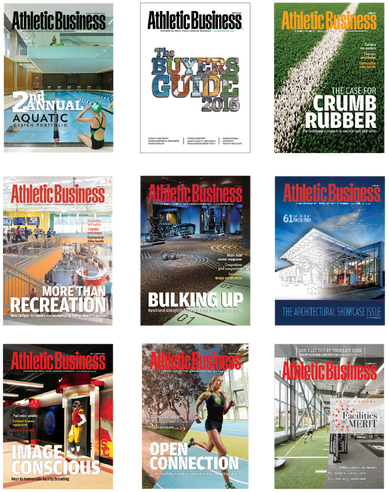 As we look back at the past 40 years of Athletic Business, the April 2017 issue will highlight the evolution and future of college recreation, fitness equipment, synthetic turf, stadiums and aquatics – while also including other content and topics our audience has grown to love over the years. BOGO offer is for 1/2 page or larger ads and is exclusive to April 2017 issue. Free ad must run in April 2017 issue. Whether you are looking for print, digital or in-person marketing and branding solutions, Athletic Business is your premier marketing partner. Our 40,000 magazine subscribers and 2 million+ online visitors are looking for the latest products and services to help them run better, more efficient facilities and programs. But don't just take our word for it, check out some of our customer testimonials here. We have what you're looking For and the target you need. ​Our goal is to provide ongoing value to our readers with articles and content that keep them up-to-date on the latest industry news and trends while at the same time connecting them to the products, services and solutions they need, from companies like yours. Check out our 2017 Editorial Calendar to see all the exciting things we have planned for 2017. 45,000+ Emails. 2 Million+ Online Visitors. Athletic Business is at the forefront of digital marketing solutions designed to captivate and engage our 45,000+ email database and 2 million+ website visitors. With a 31% average open rate for our daily E-News and a 26% average open rate for our Custom E-Mail solutions, we have the digital engagement and list integrity to drive new leads and ROI for your business.